You can also reserve a badminton court to play table tennis. Or you can play floor hockey, or do open training in the volleyball / basketball courts. Drop-in schedule and booking information. Open court use available for floor hockey, open training, or other activities. 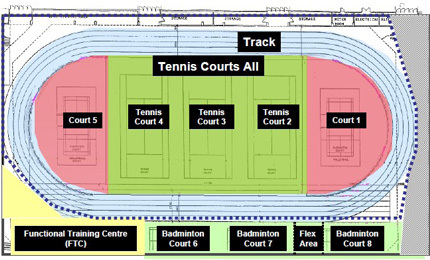 Book one of 3 indoor tennis courts. Book A Court Online. Please note, before 7pm all bookings must be scheduled on the hour and be 60 minutes in duration. After 7pm bookings can be scheduled any time and in 15 minute increments. Reserve a court. Courts may also be available for drop-in use if they are not booked at the time. Badminton courts are available for play only. Formal coaching and instruction are not permitted.